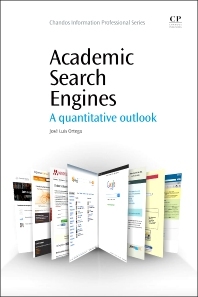 What is an academic search engine? Academic Search Engines: intends to run through the current panorama of the academic search engines through a quantitative approach that analyses the reliability and consistence of these services. The objective is to describe the main characteristics of these engines, to highlight their advantages and drawbacks, and to discuss the implications of these new products in the future of scientific communication and their impact on the research measurement and evaluation. In short, Academic Search Engines presents a summary view of the new challenges that the Web set to the scientific activity through the most novel and innovative searching services available on the Web. This is the first approach to analyze search engines exclusively addressed to the research community in an integrative handbook. The novelty, expectation and usefulness of many of these services justify their analysis. This book is not merely a description of the web functionalities of these services; it is a scientific review of the most outstanding characteristics of each platform, discussing their significance to the scholarly communication and research evaluation. This book introduces an original methodology based on a quantitative analysis of the covered data through the extensive use of crawlers and harvesters which allow going in depth into how these engines are working. Beside of this, a detailed descriptive review of their functionalities and a critical discussion about their use for scientific community is displayed. Librarians and Information Scientists that wish to improve their knowledge about the new search services, including reliable assessments. Researchers and scientists that desire to use these engines to find relevant information and to observe their research and networking performance. José Luis Ortega is a web researcher in the Spanish National Research Council (CSIC). He achieved a fellowship to the Cybermetrics Lab of the CSIC, where he finished his doctoral studies. In 2005, he was hired by the Virtual Knowledge Studio of the Royal Netherlands Academy of Sciences and Arts, and in 2008 he received a full position in the Vice-presidency for Scientific and Technological Research at the CSIC, working in research evaluation. He collaborates with the Cybermetrics Lab in research areas such as Webometrics, Web usage mining, Visualization of Information, Social network analysis and Web bibliometrics.